We have integrated Zapier into the Invoicing module. Using which you can send all the invoices created in ReportGarden to QuickBooks effortlessly! As we heard from you that you are using Quickbooks and other financial softwares to get the financial things done. To send the invoices on advertising spend to Quickbooks. 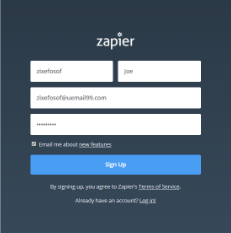 Click on Send Zapier at the end of an invoice. A user should have his/her own Zapier account in order to connect ReportGarden with Quickbooks. The user cannot edit an Invoice after sending it to the Zapier. In case, If the user enters an email id which neither exists in ReportGarden nor Quickbooks, we will not display any error message in ReportGarden. But, in backend the action would fail and couldn’t send the invoice to Zapier. Click “Create this Zap” button. You’ll see the steps to do in left side navigation. Click “Continue.” You’ll see a form waiting your inputs.